The Monk Stephen of Ozersk and Komel'sk was born in the latter half of the XV Century in the Vologda lands. His father served at the prince's court, but the mundane life was not for the soul of the youth. He went off to the Glushitsk monastery of the Monk Dionysii, where he soon accepted monastic tonsure. 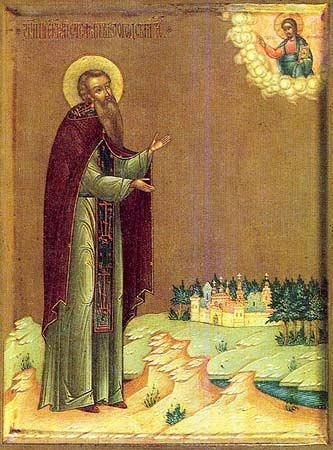 With the blessing of the Glushitsk hegumen, the Monk Stephen made the rounds of the northern monasteries, in order to discover the spiritual customs. Having returned to the Vologda lands, he settled near the source of the River Komela. The Monk Stephen led a strict life. Once during the time of tearful prayer the monk was granted to see the MostHoly Virgin and Saint Nicholas, who besought the Mother of God to bless Saint Stephen to establish a monastery. In the year 1534 the Monk Stephen built a church in the name of Saint Nicholas. The monk reposed peacefully in the year 1542.